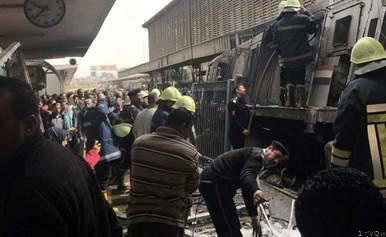 CAIRO – At least 25 people were killed and 50 injured when a locomotive smashed into a barrier at Cairo’s main train station on Wednesday, causing an explosion and fire, state television and witnesses said. The fire sent black smoke billowing above Ramses station in the centre of the Egyptian capital. Inside the station, the train’s blackened engine could be seen tilted to one side next to a platform. Security sources said there was no indication that the crash was deliberate. Prime Minister Mostafa Madbouly announced from the station that the incident would be investigated and anyone found responsible held to account.